Causeview Actionforms now allow you to customize your giving amounts by passing amount parameters through the form URL. This provides you with the ability to change the giving amounts displayed on the form at any time. Where $1:1;$2:2;$3:3 are the giving amounts (the first value is the Display Amount and the second value is the Amount being processed). So if you want to have a button that shows $20 as a giving amount, you would enter it as $20:20. Where $10 - Textbook is the Display Amount and 10 is the Amount. You can have a combination of Amount and Text as the Display Amount as long as the numerical value in the Display Amount matches the Amount being processed. 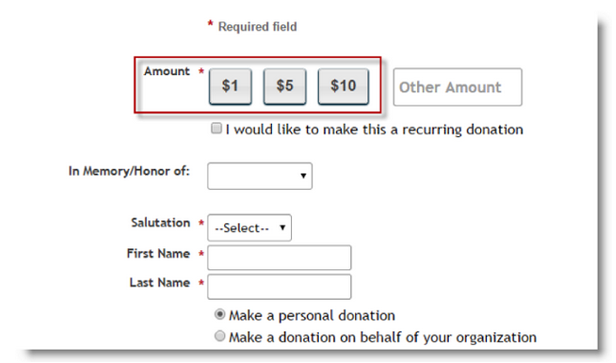 You can have as many Giving Amounts as you need and the form will adjust to create the radio buttons. However, please note that forms that do not have buttons (forms where you only have a custom amount box and there are no Giving Amount buttons) will not accept these parameters.